When last we left The Scorpion King, he had been horribly mutated by the Egyptian god Anubis into a bad CGI villain, and ended up with a spear through him anyway. Bad way to start a franchise with one of the most popular wrestlers in the world. So let’s make a deal, Universal Studios. Let’s both of us try to pretend that The Mummy Returns never happened, and get on with the business of this new franchise, The Scorpion King. It’s actually quite easy to do, because already there are contradictions between the set-ups of the two movies. And The Scorpion King has the courtesy to tell an actual story instead of just set up levels of the inevitable videogame challenge. 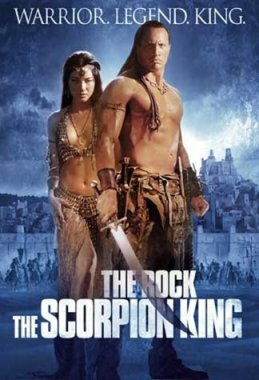 Though The Scorpion King comes from the mind of Stephen Sommers, who masterminded The Mummy series, director Chuck Russell gives this movie a very different feel, more in line with the silly costumed epics of times past than a special effects freakshow. Sword and sorcery flicks are rarely done well, and though The Scorpion King cribs from many different movies to get there, it’s a worthwhile popcorn movie. Owing so much to the Conan concept that it’s more of a bow, scrape, and kiss his sandal than a mere nod, The Scorpion King wastes no time in proving what a savage and cool hero it has. A nameless barbarian tribe has captured the brother of Matthias (The Rock). As Schwarzenegger would say, “big mistake.” Armed only with a bow, arrows, a sword and an eyebrow, Matthias wipes out the tribe in short order. He and his brother are the last Akkadians, one of several tribes threatened with extinction by the mad warlord Memnon (Steven Brand), who proves that even before recorded history, you could count on the snooty British guys to be evil beyond measure. Memnon is founding an empire based on destruction, not civilization. To ensure victory, he consults Cassandra, a prophetic sorceress (Kelly Hu, who clearly dropped the “bba, Hubba” for her screen name) before every battle he wages. Without her, his burgeoning empire will fall apart. The dwindling free tribes gather to discuss a plan. It’s a motley bunch, an early example of the pretty cool multi-cultural casting that runs through the movie. And they’ve got Amazons. Matthias shows up, hired to kill the sorceress, or at least show her what a real man is like. You can see what’s coming next, but it isn’t so much what happens in these things as how it does. In Russell’s hands, the movie unfolds at a steady pace, never lingering too long on any scene. With the completely unfunny comic relief (Grant Heslov), it’s a relief. Conversely, the action sequences actually make sense and (Jordan Rosa will appreciate this) appear to be accomplished by real people. In order to get a PG-13 rating, the actual blood and gore remains offscreen, no more than you might see on an average classic Star Trek episode. (Just the occasional dynamic trickle of blood.) But you won’t miss it. Most of the actors make it work. The bad guys sneer their way through the awkward patches. Hu realizes that with the kind of costuming she has, nobody’s listening to her anyway. If you should happen to notice that she speaks, you’ll discover that she has just the right touch. Surprisingly, only Michael Clarke Duncan comes off as a little unsure how to deliver his speeches; he, too, is best with a sword and a growl. Carrying his first film, The Rock stakes a pretty convincing claim to the title of next big action hero. As is only fitting, Matthias is a man of few words. But even when he utters a clever quip, The Rock does not look like he’s trying to start a catchphrase. He displays an easy charm, even when working with the little kid thrown in to make this movie something for everyone. Credit goes to him, too, for making his growing attraction to Cassandra have a thru-line; when it comes to fruition, we’ve seen it build instead of just seeing it coming. 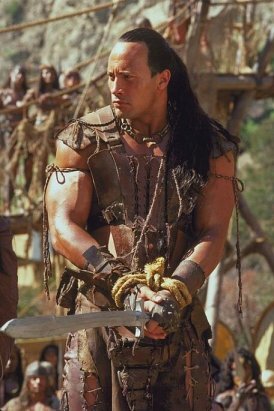 Yes, Vin Diesel may get the part as Conan’s son, but The Scorpion King has offered up his true heir. He may not be there yet, but it’s only a matter of time.